I recently asked my fans on Facebook which of my "classic" images they would most like to see redone using my modern tools. I received over 100 replies but would you believe not a single one of them requested I revisit "Of All Places" from 2007? Regardless, I was trying out a new method for creating rocky structures using Zbrush and the revision sort of happened naturally. This scene departs from the original a bit in that it is set more in a rocky ravine than a dark cave. I rendered the original using Lightwave but used Vue for this scene. I hope you like the update! A tree hiding at the bottom of a cave is nicely weird. loos so clear, like a highend photo. At first glance I thought I was seeing an underwater scene. The brightly lit rock faces in the upper part of the image looked like some kind of fish and the blue patterns on the bottom made me think of sunlight through water. Yeah, I know, there's a tree there so I got it now. However, why not try something underwater -- a flooded landscape that was once above the waters. For me, this piece just didn't turn out the way I expected. I find the rock faces in the rocky ravine are far too polygonal and stand out in a really jarring way because of it, and made worse by the lighting. The textures seem lower quality on those same rock walls than your usual work as well. Also, I find the reflective pattern on the water near the rocks at the bottom just doesn't mesh with the image. I feel like all of your latest work is superior to this image. I know I'm being harsh here, but I'm genuinely looking forward now to your next piece; I just have to take a hard pass on this one. Its nice but to my eyes there are too many straight lines and weird angles. The contrast between the lit rocks and those in shadow is just too jarring. Like many, I like the original version so much that a redo didn't seem needed. This is a good picture, but it is too different and lacks the lonelyness and tranquility of the original. In my mind it doesn't register as a revisit of the 2007 picture, more like part of a set. Only bad thing is that the brightness makes me want to adjust my screen settings. The original "Of All Places" from 2007 is without doubt my number one favorite on the entire site. What really speaks to me in the original is the tranquility and solitude. I dream about sitting under the tree in cave and, for a while, be completely separated from the world. The only place I can imagine to be equally peaceful would be an undiscovered tomb. The new edition is admittedly amazing, but it lacks the atmosphere of the original. I would really love more images that speaks of tranquility and solitude. This is a nice render in and of itself. However, "Of All Places" implies an unexpectedness or uniqueness that a tree in a ravine just doesn't possess. Trees in ravines are always a delight when you find them, but they're hardly rare. A tree growing in a cave, like the whole rainforest in that cavern in Vietnam, is unique and unexpected, and no doubt would have a lot more people exclaiming "Of all the places to find a tree..."
But you've stated that you weren't really going for a remake; the image just sort of happened. This isn't a new version, more like an "Inspired by..." piece. But I would have saved the title for an actual re-creation, and the original "Of All Places" doesn't really seem to need one. As someone else has written, there's a lot to be said for atmosphere over technique. "Knew it from the Email headline..."
...was not disappointed. *smacks the golden button* er none here? Okay.. 10 it is. This has always been one of my favorites, Ryan. I really like how you reworked it - the water is nice and lends a 'cool' feel to the piece. Nice job and THANKS!! I really like this version. I like that it is not as dark. Sometimes you need something bright. The original was good but this is definitely a nice upgrade. I really like this one and it truly is a new picture as the old one is quite a bit different. Haven only seen the Grand Canyon from above, I would imagine this is what a hidden grove might look like in some far corner of the bottom of the canyon. Great job! "The old one is better"
Love this render. Great job Ryan!!! This reworking is amazing!!! Yes, the foreground rocks are great, the tree is beautiful. However, the water surface around the tree does not flow well into the foreground area with the turquoise color highlights in the foreground. This is great! I love the blues and greens; very relaxing. Could you make the detail on the background rocks stick out just a little bit more? When I first saw it, I thought the lighted part of the rocks in the background were just floating in space.... It took awhile for me to actually see the detail. What if the light source came from behind and above everything, like the sun was setting? I wouldn't get too hung up on comparing this to the original since I didn't explicitly set out to create a new version. 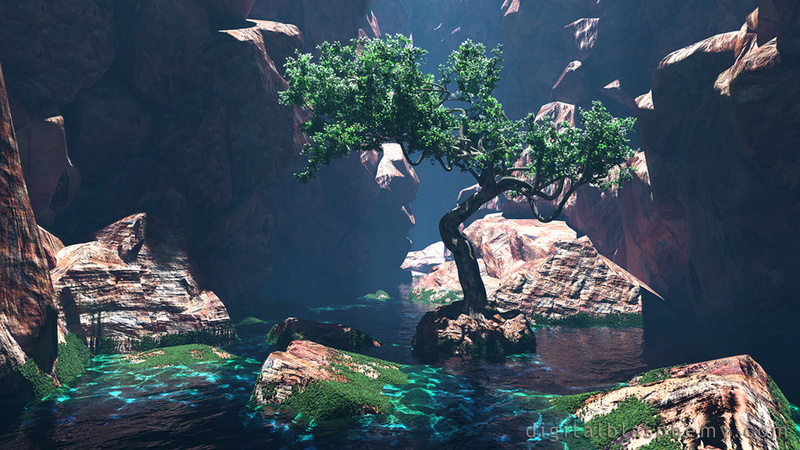 I, basically, created an enclosed rocky space and then thought that a hi-res tree model would make a nice centerpiece. The final product reminded me of the setup from "Of All Places" so I chose to reuse that title. Pun intended. I really like this one as my new background at work. The blues and greens are the right mix to sustain my productivity when I close extra windows (in my three monitor set-up) to focus on a single task. Refreshing and invigorating. I didn't have the 2007 version, so I'm not making a comparison of versions. This stands on its own to me. I tend to agree with Richard H. that this version is not as moody or emotive. 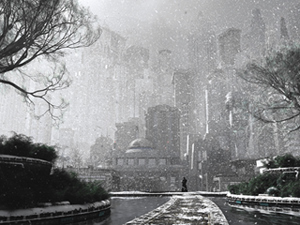 I also prefer the 2007 render in terms of the feelings that it elicits, but I like the technique in this one. I think it's likely that no one requested a redo on "Of All Places" because we all liked the original so much. I really enjoy the updated version of this, but I do miss the aspect of a tree growing in the light of a hole in a cave. Maybe more than one version is in your future? The image overall is good but it has two flaws that keep it from rising to your usual quality. The rocks in the foreground are fantastic. But that very quality makes the ones farther from the viewer less believable. Also the shadow contrast makes the first impression that of a hand full of scattered rock fragments floating in the air above the scene. …I have to say, unfortunately, that I much prefer the original! The 2007 render is moody and atmospheric, and I really wish there were a 5K version for me to download. This new one strikes me as strangely lacking. It's lost all its atmosphere, the sunlit bits of rock look like weird jagged shapes in the surrounding gloom, and overall it looks much more computer-generated and less convincingly real than its decade-old predecessor. So I'm afraid I don't find this one a great success. Sorry!